We have recently changed our support system, part of this change involved a new host for our Support Knowledge Base, where the Support tab of the software looked for information. Some items will not function as expected on this page when viewed within the software, as cookies are not saved by default, there should be a dialog when a cookie will be required. You will be unable to Sign In to the support system without cookies enabled. 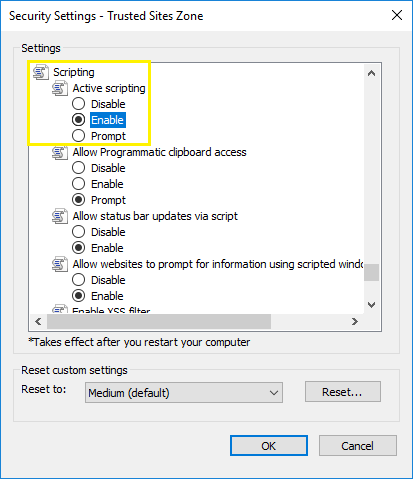 This change should not impact our customers that have NovaBACKUP installed on a Workstation Operating System, such as Windows 7, 8, 8.1, or 10. 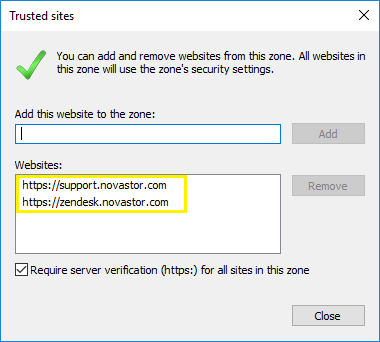 For our customers that are using a Server OS, such as Windows Server 2008, 2012, or 2016, depending on the Internet Explorer settings on the machine the information on the Support Tab located within NovaBACKUP will not work correctly without some adjustments to Internet Explorer. Select the checkbox "In the future, do not show this warning"
There may be a warning message indicating your machine may be at risk when using these settings, this will show when you adjust any internet options from their defaults. Open NovaBACKUP, navigate to the Support Tab, see if it loads. 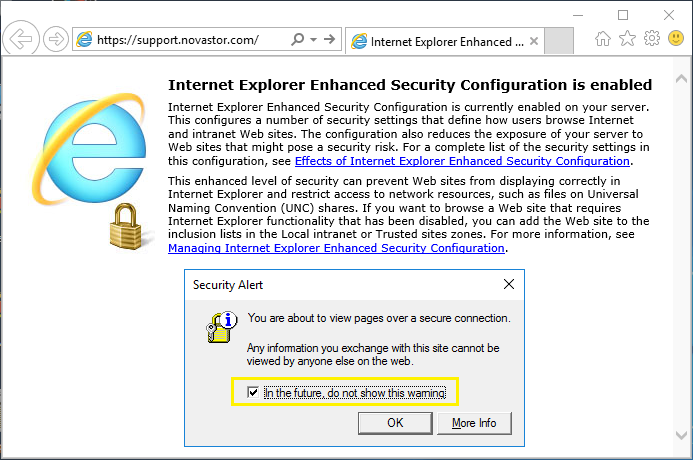 You may need to clear your Internet Explorer cache by Resetting them to their default values, including the option to "Delete personal settings".